Don’t you just hate it when your gum loses flavor? It turns the flavored piece of chemicals into a bland, unflavored piece of chemical. But what do you do with it? You can’t keep it in your mouth forever, of eventually you’ll end up with a mouth full of chewed-up gum and have no room for food or desserts. Here is the correct way to dispose of flavorless gum. Spit it into your hand. If you spit directly into the garbage, trash germs can climb up your spit and infect you. Find a boring part of the street lacking decoration or panache. Warning, too much panache on the street will cause a combustion, so don’t put your gum there and add panache. Carefully place your gum on the ground. The correct juxtaposition can actually raise property values. Wait above the gum maintaining the temperature for about 5 minutes so that it hardens in the correct shape. Make sure nobody comes by with a thermostat to change the temperature. Leave the gum, running as fast as possible. If you are in a building be sure to push people out of the way. If you return in a week and the gum has been stepped on, you will find your true love in approximately 34 business days. If it has not been stepped on, you will die alone, If is has been cleaned they know who you are. They will come after you. There’s no stopping them. Don’t swallow your gum. You don’t know where it’s been. The type of gum that you leave behind says a lot about you. Chiclets mean that you aren’t racist. Trident means that will be recognized as a higher blood when Atlantis invades. 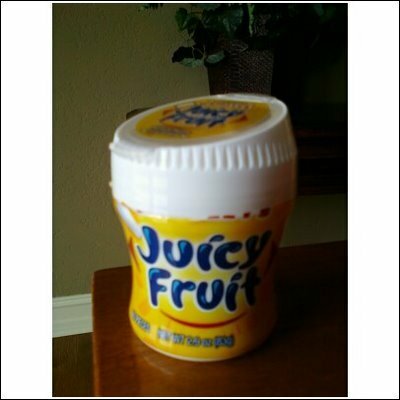 Juicy Fruit means that you are an eternal failure. If you leave gum on the bottom of a desk, you are asking to die alone. Ancient gum used to be formed from the bones of horses. If you find horses in your gum now it counts as a serving of meat. Gum-chewer is a derogatory term for anybody who misspells Guam.